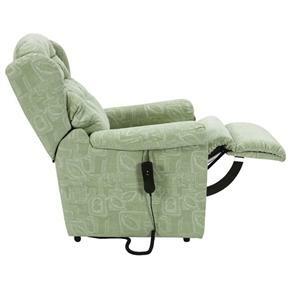 Seattle Intalift Rise And Recline Low Cost Armchair. The Seattle Intalift electric rise and recline chair is one of our more budget-conscious options but it is a superb choice nonetheless, with a safe, gentle lifting action, comfortable reclining position for a nap or just a rest, and cheerful, stylish upholstery. The Seattle has three independent motors that let you position leg rests and back support just where you want them. This is particularly useful if you need to lift the legs above your head to relieve circulation problems or ease pressure. 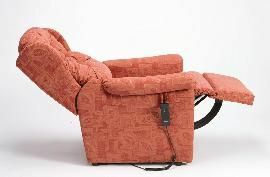 The motorised lifting system is durable and engineered to last, so you can rely on this electric rise and recline chair with peace of mind. There is an in-built battery backup system too, and the control handset is easy to use. It's no wonder that the Seattle Intalift is such a popular choice. 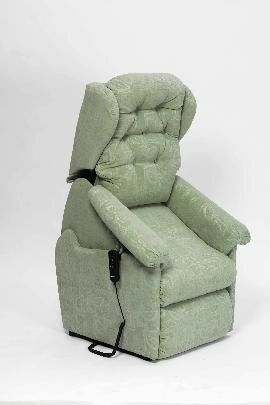 It really is an excellent riser recliner at an excellent price. 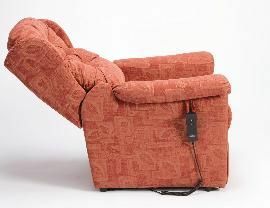 All electric rise and recline chairs are delivered by an experienced engineered at the time that's convenient for you, set up, checked and demonstrated. The engineer will also take the packaging materials with them- no mess and no fuss. Fixed chair appearance, particularly near floor. The chairs inner mechanics are not visible at any position. Full matching fabric cover to elevated inner frame. Stylish Button-Back providing excellent comfort. Excellent quiet and smooth actions. Available in three stunning fabric colour options; Green, Teracotta or Gold. New safety mechanisms approved by the Medicines and Healthcare products Regulatory Agency (MHRA). In-built fail-safe battery back-up system.